The South African Gifts and Comforts Fund was a benevolent fund that sought to give comfort and messages of motivation and support from the public in South Africa for all the tens of thousands of South African volunteers who went off to war during World War 2. It was created by Field Marshal Smuts, and administered by his wife “Ouma” Smuts and her “Band” of Voluntary Workers in co-operation with the Quartermaster-general. Gifts to the servicemen and women during the war reminded them of home comforts and reinforced the moral support they were getting from home in their fight against European tyranny, Especially over times like Christmas when family and “home” became a yearning for anyone enduring the hardships of war. Known as “Glory Bags” at the time, these parcels contained all sorts of reminders from home, Christmas Cake etc. and collectable items such as Christmas anniversary cigarette tins, which became highly popular – stamped with an image of both Jan Smuts and Ouma Smuts and giving good Christmas wishes. This entry was posted in cigarettes, South Africa, WW2 on March 23, 2019 by hatchfive. Today when we think of the Great War we tend to think almost exclusively of the fighting on the Western Front. This was certainly the main focus of fighting, but troops were deployed across the globe and tonight we have a delightful souvenir from those troops stationed in the Middle East. This cigarette case is exactly what you look for as a collector- it’s attractive, named, dated and even has the location engraved into it! The case is made of brass that has been silver plated and in the bottom right hand corner there is an engraving of the cap badge of the Army Service Corps: The lettering indicates that this case was owned by M/348444 George Armstrong of 1019 Company who were based in Mesopotamia and Persia and there is even a date of 1918. As a collector it doesn’t get much better than this! Sadly I have so far drawn a blank on the man himself, although I have discovered that 1019 Company were a mechanised transport company that was based in Basra in what is today Iraq in 1918, they were issued with Ford vans. The case itself is quite small and is gently curved on the rear to fit snugly into a pocket, following the curves of the owner’s body so it is comfortable to use: Inside a pair of elastic straps are fitted to hold the cigarettes in, surprisingly they are still supple and a little stretchy even after a century: This is a delightful little object and hopefully the research will come together to help me tell George Armstrong’s story. 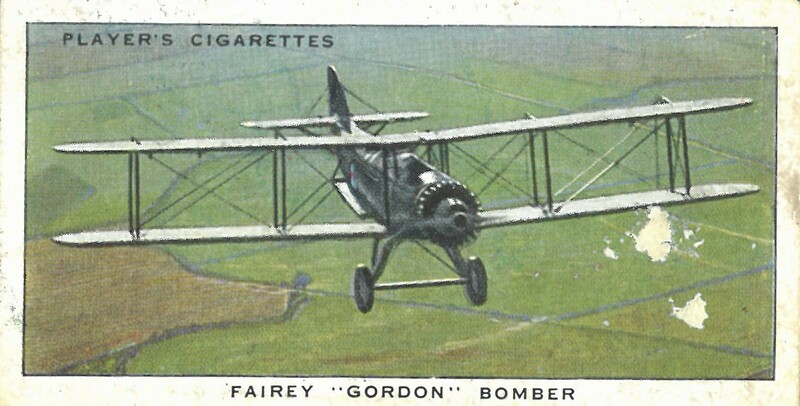 This entry was posted in British Army, cigarettes, Souvenir, WW1 on January 29, 2019 by hatchfive. Our illustration shows a British Major (in Full Dress) of the 1st Battalion (Coke’s), which was raised in 1849 by Captain Coke as the 1st Regiment of Punjab Infantry. Shortly after this date it became part of the Punjab Frontier Force which was maintained till the beginning of this century as a local force for the protection of the North West Frontier. Under Lord Kitchener’s regime this localisation ceased an all infantry battalions of the Indian Army now share the guarding of the frontier, as well as other duties which fall to their lot. Coke’s Rifles saw fighting in the Great War in East Africa and on the North West Frontier. Our picture shows the Subadar-Major (the senior Indian officer of the 10th Battalion) in Full Dress. In each Indian Regiment the 10th is the Training Battalion, which trains the recruits and acts as record office for the three, four or five active battalions of the Regiment. The Dogra Regiment is recruited entirely of Dogra Rajputs, who are high caste Hindus descended from the original Aryan invaders of India. They inhabit the foothills of the Himalayas between the Jhelun and Sutlej rivers in the Punjab. It is one of the few regiments which is composed of a single class, the majority being made up of class squadrons or companies. The Victoria Memorial, Calcutta, appears in the background. The 120 Infantry battalions of the Indian Army include twenty of Gurkhas. These are divided into ten regiments of Gurkha Rifles, each with two battalions. The most senior of these dates back to the end of the Nepal War in 1815. The 10th is the youngest, having been formed in 1890, but during the Great War it earned a reputation equal to that of the older regiments in Gallipolli, Eqypt and Iraq. These regiments are composed entirely of Gurkhas, turdy and cheerful little hillmen of Mongolian stock, who are subjects of the allied kingdom of Nepal. The rifleman shown in Full Dress in the picture is wearing the famed kukri, of Gurkha knife. The Indian Mountain Artillery batteries, which number twenty-one, are units of the Royal Artillery, and their number is on the increase, as new batteries are formed to take the place of light batteries which are disappearing form the British Army. In the rough country of the Indian Frontiers, where hills are steep and roads are few, there is still room for artillery carried on mules, which can cover ground impassable to mechanised or horse-drawn guns. There is in addition an Indian Regiment of Artillery which came into being in 1935 and which consists at present of one field-brigade. This will ultimately be officered entirely by Indians. Our illustration shows a Subadar-Major in Full Dress. The Alwar State Forces, of which our picture shows the Commandant in Full Dress, consist of two troops of Lancers and one active and one training battalion of infantry. The forces of the Indian Princes which are classed as Indian States Forces are organised on the same lines as the corresponding units of the regular Indian Army. The active units of the Alwar Forces served in the Great War, the Lancers on the North West Frontier and in Afghanistan, and the infantry battalion in Egypt and Palestine. Alwar, which is situated in Rajputana, has a population the three quarters of a million. Bahawalpur is a Mussalman state lying to the south-west of the Punjab with an area of 15,000 square miles and a population of about one million. The Nawab of Bahawalpur maintains as Indian State Forces one troop of bodyguard lancers and one and a half battalions of Infantry. The Major shown in Full Dress in our picture belongs to the 1st Bahwalpur Infantry (Sadiq Battalion). The Bahawalpur troops have more than once been loaned for Imperial purposes, and in the great War the Sadiq battalion served in Egypt, Palestine, Iraq and Afghanistan, as well as on the North West Frontier of India. The Sadiq Garh Palace is shown in the background. The officer shown in Full Dress in the picture is the Lieutenant Colonel of the Baria State Forces, which consist of about 150 men organised as one troop of cavalry and two platoons of infantry. Baria is a Rajput state in Western India covering about eight hundred square miles and with about 160,000 inhabitants. The Raja of Baria, who takes a great personal interest in his forces, was promoted in 1937 to the honorary rank of Lieutenant-Colonel in the British Army. The background shows the Secretariat, Devgad Baria. The Bikinir State Forces number about 1,800, consisting of one battery of artillery, two motor machine-gun sections, two squadrons of lancers, an infantry battalion and the Ganga Risala, a Captain of which is shown in our picture in full dress. This famous camel corps rendered good service in the early days of the Great War in the fighting east of Suez. Bikanir is one of the largest of the Rajputana states, but much of it is desert, and its population numbers less than one million. The Maharaja of Bikinir holds the honorary rank of General in the British Army and is an extra Aide-de-Camp to the king. The Old Palace and Fort, Bikinir, are shown in the background. Dhrangadhra is one of the smaller states of Kathiawar in Western India, covering an area of about twelve hundred square miles and having a population of about 90,000. The Maharaja of Dhrangadhra maintains a bodyguard of two mounted troops and two companies of Infantry known as the Dhrangadhra Makhwan Infantry. The officer shown in full dress in our picture is the Commandant of the infantry. The State-Forces are mostly composed of Rajputs, but have an admixture of other Hindus and also of Musalmans. The Delhi Gate, Dhrangadhra, appears in the background. This entry was posted in cigarettes, Documents, India, Inter-War, Uniform on October 23, 2018 by hatchfive. 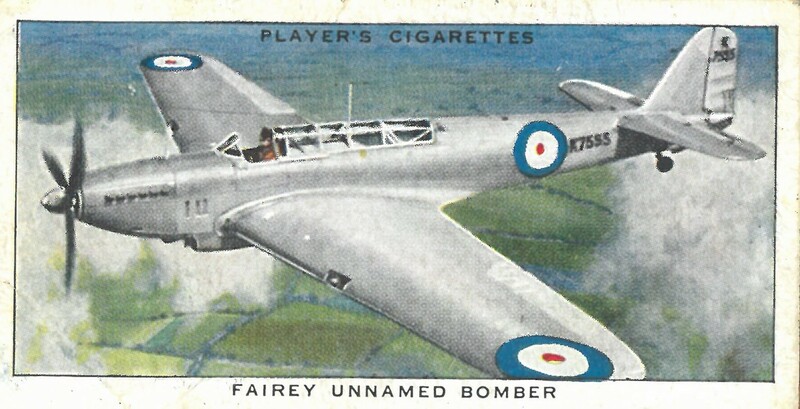 Although I do not smoke, I do occasionally pick up bits of militaria with a smoking connection, the ubiquity of this habit for much of the twentieth century ensures there are many interesting military related items of tobaccanalia out there. Tonight’s object is a heavy carved ashtray: This is made from a piece of grey marble, nicely finished and polished smooth: What interests us however is the inscription around the edges that indicates it was made as a souvenir for the Royal Engineers during their campaigns in Northern Africa in 1942 and 1943: In the centre is a carved formation badge for the First Army: This badge consists of a shield, with a crusader cross on it and a sword superimposed upon it, this formation was assembled for the allied landings in Operation Torch. On October 23 Montgomery mounted an attack against the German line at Alamein. He had received reinforcements from Britain of tanks, guns, etc and the guns (900) were massed on the front and for the start of the battle fired a barrage the like of which had never been seen before. Our job in the battle was to remove mines in the German minefields to make gaps for the infantry and tanks to pass through safely. The Germans had roughly 20-30 different types of mines, which we had to learn how to defuse. The most famous was the Tellex mine, which was for use against tanks and when it was laid could be booby trapped. Another was the anti-personnel mine which when trodden on jumped up about 3 feet in the air and exploded. All that showed above ground were three small antennae, which were very difficult to see but both types were picked up on the mine detection which was very much like a vacuum cleaner. The Battle of Alemein in 1942 was the turning point of the war in the desert and the German and Italians were pushed back past Tripoli. We had a victory parade in Tripoli marching down the main street behind bands of bagpipes, but after that it was on to Tunis (capital of Tunisia). Before that the 1st Army and Americans landed in Algeria so the Germans were pinched between two armies, 8th in the east and 1st in the west and it wasn’t long before the Germans and Italians surrendered and the war in North Africa was over. 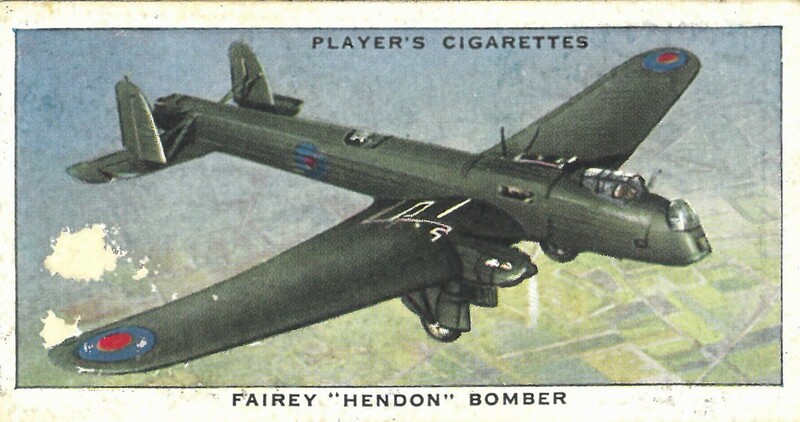 This entry was posted in British Army, cigarettes, Souvenir, WW2 on January 23, 2018 by hatchfive. 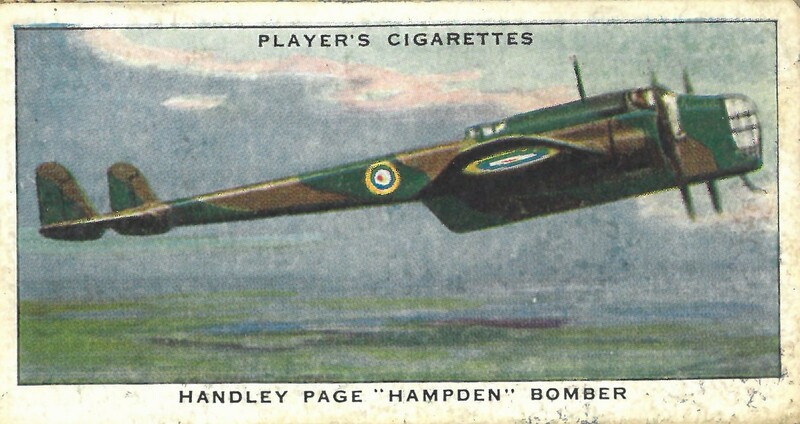 Tonight we come to the fifth and final post covering the RAF Aircraft cigarette cards published by Players in the late 1930s. I hope you have enjoyed these posts as much as I have, many of these aircraft are virtually forgotten now and I must confess to having a soft spot for the lumbering biplanes of the interwar period! 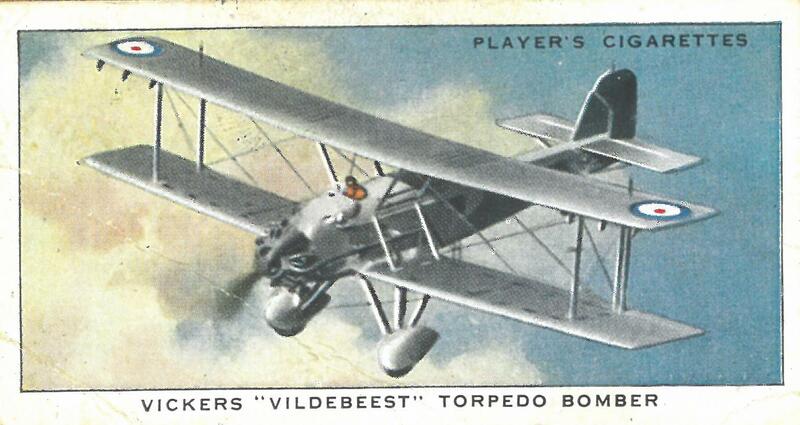 Card 41- Airspeed Unnamed Radio-Controlled Target Aircraft. Designed for the Navy and Army Anti-Aircraft Batteries, this aeroplane made its first public appearance at the Royal Air Force Display at Hendon in June 1937. Although still officially unnamed, it is usually referred to as the “Queen Wasp”. The engine is an Armstrong Siddeley “Cheetah” air-cooled 7 clylinder radial. Performance details of this aircraft are still secret. Arrangements are made for the fitting of floats in place of the usual land undercarriage, enabling the aircraft to be used either as a landplane or seaplane. The “Queen Bee” is virtually a standard D.H. “Tiger Moth” equipped as a radio-controlled pilotless aircraft for use as a gunnery target. Apart from the radio-control equipment, the “Queen Bee” is also fitted with catapulting points and slinging gear, and may be used either as a landplane or seaplane. The engine is a “Gipsy-Major” 4-cylinder inverted air-cooled motor of 130 h.p. Performance details are not available for publication. H.M. The king witnessed a demonstration of “Queen Bee” flying when he visited the Fleet in June, 1938. This aircraft, which is designed for training, is a graceful low-wing monoplane, built by Airspeed Ltd., and fitted with two Armstrong Siddeley “Cheetah X” engines of 350 h.p. each. The equipment provides for training in navigation, bomb aiming and wireless operation. The “Oxford” has a wing span of 53 feet 3 inches and a top speed of 187 m.p.h. Its flight endurance is 5 hours. It is finished in bright yellow, the distinguishing colour of trainer aircraft. An adaptation of the well-known Avro “Tutor” specially equipped for navigational training in the Royal Air Force. Full cloud-flying equipment, blind-flying hood, etc., are provided. Except for this specialised equipment the “Prefect” is identical to the “Tutor”. An Armstrong-Siddeley “Lynx” engine of 215 h.p. is fitted. The aircraft has a wing span of 34 feet, a length of 26 feet 6 inches and a height of 9 feet 7 inches. A two-seater equal span single-bay training aircraft, used for elementary training. Complete dual control is fitted, and a 215 h.p. Armstrong Siddeley “Lynx” 7-cylinder radial air cooled engine provides a maximum speed of 122 m.p.h. A seaplane version of this aircraft, known as the “Seatutor” is also built, and is almost identical to the landplane apart from having a slightly lower performance. The “Tutor” has a wing span of 34 feet, a length of 26 feet 6 inches and a height of 9 feet 7 inches. This aeroplane was designed as an efficient elementrary and intermediate training biplane, but in addition it is used in the Service for communication duties. Complete dual control is fitted and, if desired, floats may be employed in lieu of wheels, rendering the aircraft suitable for seaplane training. A D.H. “Gipsy Major” 4-cylinder-in-line inverted air cooled engine is installed, and in the case of the landplane produces a maximum speed of about 109 m.p.h. The “Tiger Moth” has a wing span of 29 feet 4 inches, a length of 23 feet 11 inches and a height of 8 feet 9 ½ inches. A low wing trainer monoplane built by Phillips & Powis, the Miles “Magister” is fitted with a de Havilland “Gipsy Major” engine of 130 h.p. Its lines are noticeably graceful. The wing span is 33 feet 10 inches and the length 25 feet 3 inches. The cockpits are open and are set tandem fashion. There are full controls and instruments including blind-flying equipment. Like other trainers, the “Magister” is finished in a bright shade of yellow. Trainer aircraft are specially designed and fitted for the highly important functions which they perform. This low-wing cantilever monoplane is a high speed trainer built by Phillips & Powis. It mounts a Rolls Royce “Kestrel XVI” engine of a maximum output of 745 h.p. The two seats are placed tandem and there are dual controls. The undercarriage is retractable, while a feature of the design is the unusually thick wing. The machine has a top speed of 295 m.p.h. Modern high-speed flying demands a special technique which this aircraft is designed to teach, but it can also be employed as a general purpose type suitable for fighting, light bombing or reconnaissance. Originally designed as a bomber, this aeroplane is now used for parachute training. An unusual feature of the design is the double set of landing wheels. The aircraft is fitted with two Napier “Lion” 12 cylinder “W” type liquid-cooled engines mounted between the wing stuts. The dimensions of the “Virginia” are imposing- wing span 87 feet 8 inches, length 62 feet 3 inches, heigh 17 feet 9 inches. A comparison of the “Virginia” with more recent types of bomber (e.g. “Battle” and “Wellesley”) shows the rapid advance made in general design. This type is a development of the “Victoria” V and VI bomber transport aeroplanes, and is fitted with two Bristol “Pegasus” II L.3 engines. Provision is made for carrying a spare engine on the bottom inner port plane. The aircraft is 59 feet long, and has a wingspan of 87 feet 7 inches. When used for transport the “Valentia” carries 21 troops besides a crew of 2, including the pilot. It has a range of about 650 miles and has been largely used for moving troops expeditiously over rough country. Most of this type are stationed abroad. This entry was posted in cigarettes, Inter-War, Royal Air Force, Uncategorized on June 23, 2017 by hatchfive. 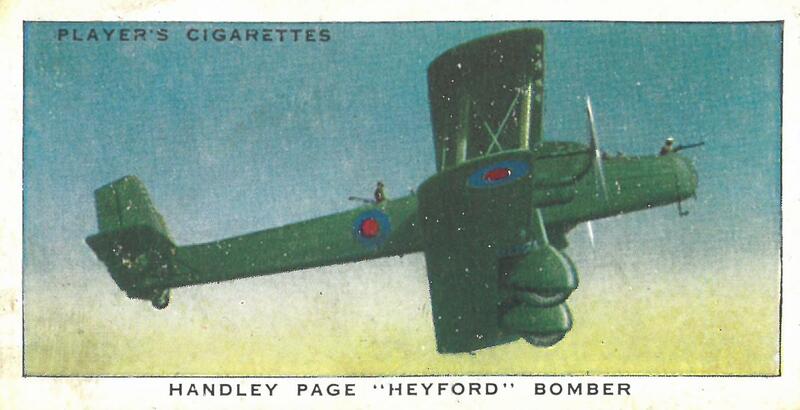 Tonight we come to the third of our five posts covering the Player’s cigarette card series “Aircraft of the Royal Air Force”. 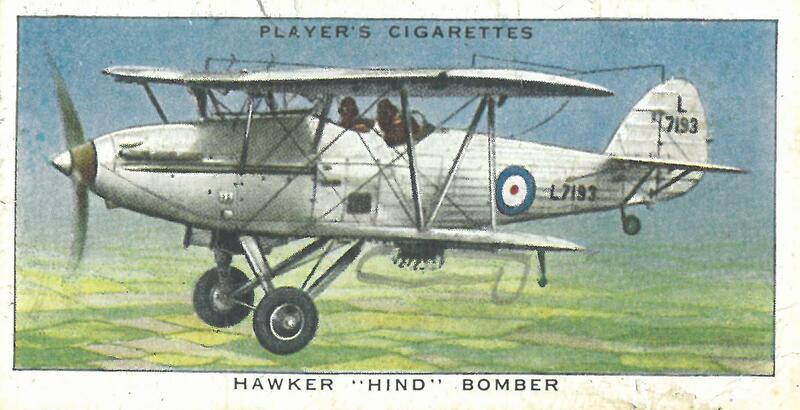 This week the cards focus mainly on fighter aircraft. This metal hull biplane, built by Short Bros. Ltd., and fitted with 4 Rolls-Royce “Kestrel” engines is the third of the “Singapore” series and is designed for reconnaissance work. The engines are mounted tandem between the wings, the lower wing being fitted with wing-tip floats for lateral stabilisation. There are machine-gun mountings at the bow, centre and tail. The aircraft develops a top-speed of 118 knots (136 m.p.h. ), has a range of 865 sea miles and carries a crew of 6. It is a sesquiplane, i.e. the wings are of unequal span. The crew’s quarters have bunks, cooking apparatus, work bench and stowage for dinghies. This entry was posted in cigarettes, Documents, Inter-War, Royal Air Force, Uncategorized on June 9, 2017 by hatchfive. 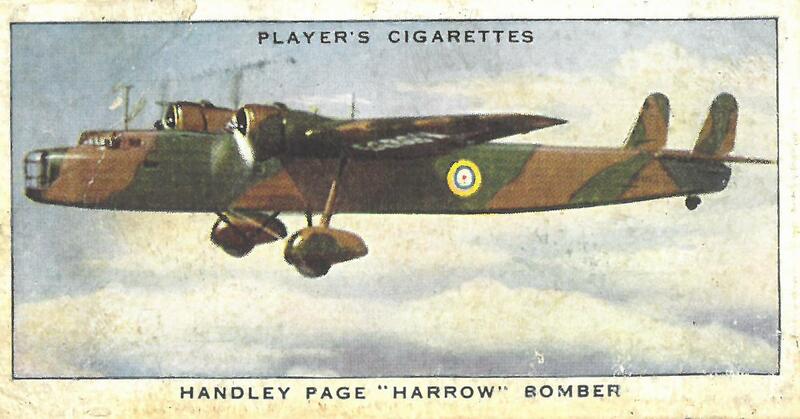 We continue our look at the 1938 Player’s Cigarette Card set ‘Aircraft of the Royal Air Force’ with cards 11-20 tonight. 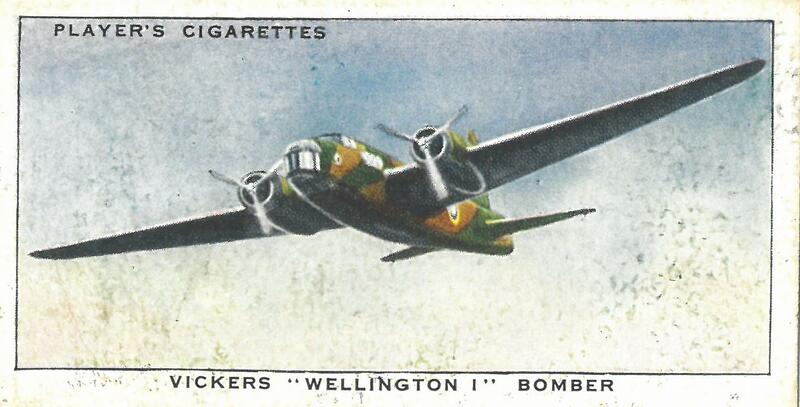 These cards focus on bombers and whilst one or two are very familiar today, most of these designs have long been forgotten. As ever the captions are the original wording printed on the back of each card. Of “Geodetic” construction, this aircraft is the first twin-engined machine to be built utilising this system, and is the subject of a large Air Ministry order. Performance figures are still secret, but it is believed that the range will be outstanding, and the maximum speed very high for an aircraft of this type. It is of all metal construction, and features of the design are the retractable undercarriage, trailing edge flaps and trimming tabs on elevators and rudder. Engines may be either Bristol “Pegasus” of “Hercules” or Rolls-Royce “Merlin”. A crew of 4 is carried. The wing span is 86 feet and length 60 feet 9 inches. 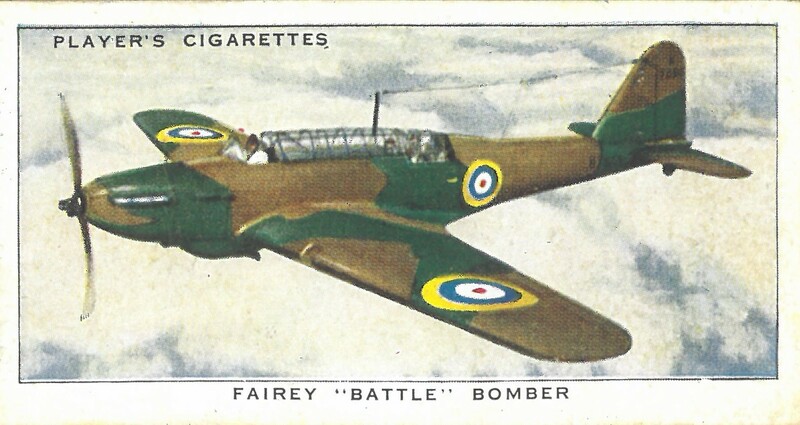 This entry was posted in cigarettes, Documents, Inter-War, Royal Air Force on June 2, 2017 by hatchfive.